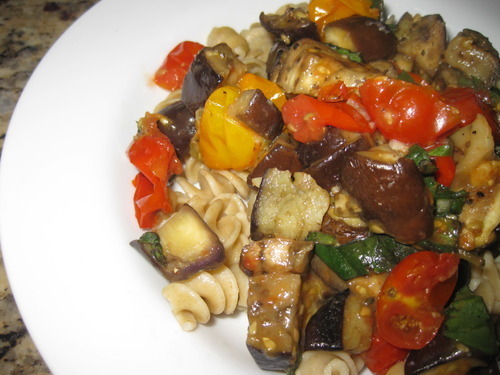 So I came up with this simple pasta dish with roasted seasonal veggies & whole wheat rotelli. Slice the eggplant into 1 inch slices & toss with kosher salt. Set the salted eggplant in a colander in the sink for 20-30 minutes to sweat. Meanwhile, preheat the oven to 400°F. Cut the cherry tomatoes in half & place into an ovenproof dish. Add one tablespoon of olive oil, the garlic & a pinch of sea salt, & toss well. Roast the tomatoes until just browning & very juicy, about 15-20 minutes. When the tomatoes are just about done, rinse & dry the eggplant slices well. Cut each slice into chunks. Toss with another tablespoon of the oil & another pinch of salt, & spread in a single layer on a baking try. Roast the eggplant for 15-20 minutes, tossing once, until browned & crispy on the edges. When the eggplant is done, add to the dish with the tomatoes, which will be cool by now. Add the rest of the olive oil, a good dose of black pepper, a touch more salt if necessary, & the chopped basil. Toss well, & serve immediately in your preferred way.